In October 2014, The National Disability Authority was asked by the Minister of State (with responsibility for Primary Care, Social Care (Disabilities & Older People) and Mental Health), Kathleen Lynch, to conduct an independent review of the process for the implementation of regulations and standards in residential services for adults and children with disabilities. By the end of April 2016, all designated centres had been inspected at least once, with many receiving more than one inspection. 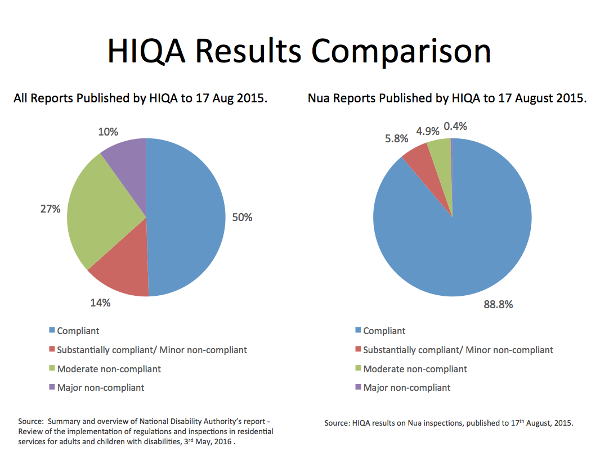 The NDA’s review comprised of qualitative and quantitative analysis of published reports, and engagements with key participants in the process, including residents, family members, staff, service provider managements, HIQA, the HSE and disability organisations. Summary findings showed all participants who were interviewed, welcomed and recognised the need for regulation and inspection in the disability residential sector. In the NDA’s sample of 192 reports, approximately 6% of those reports showed major or moderate non-compliance on all of the outcomes inspected against. To view the National Disability Authority’s full report, please click here.